Winix Plasmawave 5300 Review : Should or Shouldn't You Buy? Winix Plasmawave 5300 Review: Should or Shouldn’t You Buy? Last Updated: 19 April 2019 - This post contains affiliate links. 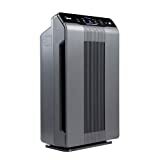 A thorough look at another model in the vast range of Winix Air Purifiers, the 5300 PlasmaWave. Yes, this model has been discontinued and replaced with the 5300-2, but it is still available to buy from certain retailers, so it’s worth a good assessment. What differs the 5300 from other Winix models? Does it produce ozone? Is it really effective at reducing dust, mold and odors? How much does it cost to replace the filters? 1 What Interesting about the Winix Plasmawave 5300? 1.1 Does it reduce dust and mold? 1.2 Does it remove tobacco, pet or diaper odor? 7 What is the cost of replacement filters and where to get them? 8 How often do filters need to be changed and can’t they just be cleaned? 11 Can I find it at other retailers like Bed Bath & Beyond? 12 What’s The Best Price For The Winix Plasmawave 5300 and where can I buy it? 13 Verdict: Is This air purifier For You? What Interesting about the Winix Plasmawave 5300? An obvious aspect to mention is that the 5300 has been discontinued, and replaced by the 5300-2. The difference between the two models doesn’t stretch far past the dimensions, weight and colour. The 3500-2 has a longer warranty than the 3500 (2 years as opposed to 1), and it has the added feature of a timer (with 1, 4 and 8-hour options). One of Winix’s interesting features included in the 3500 is the “auto” mode. The “auto” mode works in conjunction with the air quality sensor and the 4-speed fan. You see, the air quality sensor assesses the quality of the air in terms of odors and particles, and adjusts the fan speed accordingly. For example, if the room is suddenly filled with cooking smells and smoke, the air quality sensor will kick into gear and ramp-up the fan speed to “turbo”. The air-quality LED indicator light will change colour (to red) when odors and particles are present, and will return to green or amber as the air clears. Next up, the “PlasmaWave technology“. If you’re a Winix newbie, here’s a quick explanation of this feature: the PlasmaWave uses positive and negative ions to create “plasma”, which then combines with water vapour to create Hydroxyls. These Hydroxyls attack and destroy odor, gas and bacterial particles which pass through them. If science-y words do nothing for you, all you need to know is that PlasmaWave is designed to destroy gasses, smells and allergens. I can’t mention the PlasmaWave in detail without going into the thorny issue of ozone. Some sources say that NO ozone is produced. However, others take a more vague route by saying that the PlasmaWave has been certified by the California Air Resources Board as falling under a certain limit of ozone production. Some upset reviewers claim they have had a respiratory-related reaction to what they suspect is ozone with this air purifier. The truth is, it does produce ozone, in very small amounts. More on this further down. Does it reduce dust and mold? An air purifier that doesn’t reduce dust is, in my opinion, a total waste. Dust is ugly, irritating (literally) and increases the need to clean every surface in the home. The 3500 has a true-HEPA filter which handles microns as small as 0.3, so dust-clearing should be no problem. What’s more, when using the “auto” mode, the air quality sensor can tell how much dust is circulating in the air and increases the fan speed accordingly. If these features really do what they say “on the box”, then the simple answer would be: yes, it reduces dust. However, after looking at the cleaning technology, I always look to honest reviewers to assess the dust-collecting abilities. Thankfully, what I found painted a positive picture. Sure, a few people have complained that there were no changes to household dust, but a great number more have been overjoyed with the dust-reducing ability of the 3500. I think we can safely check the “dust” box. Household mold is a more complicated issue. It breeds in humid environments, so if your home is damp, an air purifier might catch airborne mold spores, but it’s not going to kill the mold at the source. However, a true-HEPA filter (like the one in the 3500) is one of the best tools for catching mold spores. Mold spores are generally around 1 to 5 microns in size, well within the size-range for a true-HEPA to capture, (they catch particles as small as 0.3 microns). As for reducing musty, mold-related odors, the PlasmaWave technology and carbon pre-filter should help. Does it remove tobacco, pet or diaper odor? Going by the reviews, yes, it does a great job of removing tobacco and pet odors (for the majority of customers). This could be due to a mixture of cleaning features: the odor-reducing carbon pre-filter, the true-HEPA filter, the PlasmaWave technology, and the high fan speeds. A lot of reviewers have found that cigarette smoke and related odors have been greatly reduced, especially when the “auto” mode is on. The PlasmaWave does have the potential to emit ozone, but the feature can be switched off. Also, Winix do specify that their PlasmaWave technology has been tested and approved by CARB (California Air Resources Board) as being safe. Simply, this means that this air purifier does not produce enough ozone to be deemed as unsafe. However, for people who are allergic to ozone (i.e. from asthma) it’s completely understandable to avoid machines which could potentially emit any ozone at all. It’s important to remember that even though tiny amounts of ozone can be produced, those tiny amounts could build up over time, creating a not-so-safe environment for asthmatics. You can turn the PlasmaWave off all together by holding down the on/off button for a few seconds until the PlasmaWave light shuts off. Let’s check out the “pros and cons” of the Winix 3500 PlasmaWave according to happy and unhappy users of this model. Now, I found the reviews for this model very interesting indeed. Some of the very negative reviews (in the 1 and 2-star sections) offered some head-scratching thoughts. Some people found this machine to be utterly useless, unsafe due to ozone, badly constructed, and even…too loud. Only 10% of the reviews are in the 1 and 2-star section, so at least it’s not a huge chunk, but it’s certainly enough to make a consumer think. The 3500 is simply is not effective: a few unhappy reviewers have found that the 5300 just doesn’t…do anything. They haven’t noticed a difference in dust, allergies or odors. Fan issues: some customers have said that the fan slows down after a short while, further reducing the effectiveness of the machine. Speaking of the fan, some people have said that the construction seems to be unbalanced, which causes the fan to hit against the interior of the machine, causing a rattling sound. Dies after a few months: the 1-star section is littered with comments about the 5300 simply breaking down and ceasing to work after a few months of operation. Some people found that power outages or even changing the filters caused the machine to refuse to work. Annoying clicking noise/too loud: an interesting complaint in the 1 and 2-star sections is that strange and annoying noises emit from the 3500. It seems to be the PlasmaWave that is causing the annoying “clicking” noise bugging so many users, as well as a high-pitched whine. Others have said that the entire operation is simply too loud, even on the lowest settings. I find this to be very curious considering that so many people in the “happy” section have said they can barely hear the machine when run on the lowest settings. Emits ozone: there’s always a good handful of negative reviews which complain of the ozone produced by the PlasmaWave. Some people have felt mislead by the description of “no harmful ozone” on the packaging, once they realise that this actually means “not much ozone”. 68% of the reviews lie in the 5-star section, and 16% are in the 4-star section. This isn’t too bad at all. But what I was really interested in finding out was what people love about this model, as the negative reviews really gave this machine a blasting. Reduces allergy symptoms effectively: a very common comment throughout the 5-star section is that the 5300 has significantly reduced the allergy symptoms of customers and their family members. People have said that they require far less allergy pills, they wake up feeling fresh and healthy, and they can finally get a solid night’s sleep. Customers who are allergic to their pets have also chimed in with positive experiences with the 5300, having noticed that their pets no longer irritate them. High praise indeed. Reduces odors: there are many reviews stating that litter box odors, cigarette odors and cooking smells have been heavily reduced by the 5300. What’s more, plenty of reviewers have been really impressed with how the air quality sensor detects even the vaguest of odors and kicks-up the fan speed to remove them very quickly. Reduces the need for dusting: happy consumers have noticed their need for dusting has been reduced by the 5300. They have found that far less dust settles on their furniture and surfaces, as well as reduced visible dust floating in the air. In turn, less dust helps to reduce dust-related allergy symptoms. Win, win. Special features/settings On/off button: when you turn the air purifier on, it will automatically set the machine to the “auto” mode. You can also use this button to turn off the PlasmaWave technology. Speed/mode button: press this button when you want to disable the “auto” mode and manually select the fan speed yourself. The speed/mode button corresponds with the speed and mode indicator lights. LED indicator lights let you know which settings you have selected, i.e.”auto” and “sleep” modes. The fan speeds are: 1, 2 3, and “turbo”. The higher the number, the more air circulation (with “turbo” moving the most air). AQ sensor: the section on the control panel labelled “AQ sensor” is where the air is assessed for quality. Air quality indicator lights: next to the “AQ sensor” is the air quality sensor indicator. This will be lit with a green, orange or red light depending on the air quality (green = good, orange = medium, red = bad). Replace filter light: this light will turn on when it’s time to replace the true-HEPA filter. This should be approximately every 12 months, but if your air is generally in the “bad” zone, you may need to replace it more often. PlasmaWave light: the PlasmaWave light below the control panel will be illuminated when PlasmaWave is turned on. You do have the option to turn the PlasmaWave off. You can do this by holding down the on/off button until the PlasmaWave light turns off. Noise level level 1 is very, very quiet. Levels 2 and 3 are quiet, and “turbo” is audible and too loud for most people to tolerate during quiet time or when trying to sleep. It’s very easy to set up and maintain. When you first take the unit out of the box, make sure all of the plastic coverings on the filters are removed and discarded. Place the filters back into the machine and make sure they’re secured properly. Find a good spot for the unit, ensuring that there are no TVs, radios or microwaves within 7 feet (the waves can mess with the PlasmaWave technology). There should be a decent amount of clear space around all sides of the filter for the best effect. Experiment with the control panel and find out which mode and speed work for you. Keep an eye out for the “replace filter” light so you make sure you stay on top of the true-HEPA filter replacements. Since you don’t need to clean the filters, yes, it is very easy to clean as the exterior does take much maintenance to stay fresh and tidy-looking. The brush attachment on your vacuum cleaner is a great tool to use to clean the outside of the machine, as it gets into the grilles on the front. A damp cloth also works a charm. Exactly the same specs (height, weight, CADR, room area, fan speeds). The yearly filters for the 5500 cost more than a year’s supply for the 5300. The 5500 has a permanent pre-filter, the 5300 does not. The true-HEPA filter in the 5500 is washable, the true-HEPA filter with the 5300 is NOT washable. The 5500 does have a remote control, the 5300 does not. The 6300 has 4-stage cleaning: carbon pre-filter, true-HEPA filter, PlasmaWave and Sanitising anti-microbial treatment. The 5300 has three of these filters, but not the sanitising anti-microbial treatment. The 6300 has a remote control, the 5300 does not. The 9500 has a far higher price point. The 9500 has 5-stage cleaning: washable pre-filter, true-HEPA filter, CleanCel anti-bacterial treatment, washable Advanced Granular carbon filter, and the PlasmaWave. The 9500 has a remote control and a timer feature, neither of which the 5300 has. The 9500 covers 284 square feet, (which is less than the 3500), and it is almost 4 pounds heavier. What is the cost of replacement filters and where to get them? It’s best to buy the replacement filters from the Winix website, as you know you’re getting the real deal. The pack you need is the “A 115155” filter pack. It has four carbon pre-filters and one true-HEPA filter. This pack will last you for one year. How often do filters need to be changed and can’t they just be cleaned? This is a replace-only machine. There are no washable filters, and they must be replaced in order for the air purifier to remain effective. Carbon pre-filter = change every 3 months. NOT washable. True-HEPA filter = change whenever the light comes on. NOT washable. You are looking at replacing a total of 4 filters a year, but you can get a bundle from Winix with all 4 filters inside (as mentioned above). Although there are mixed reviews regarding the volume of this model, I think it’s safe to say that the lowest speed levels (1 and 2) are very quiet according to most people’s standards. Level 3 and the “turbo” level are louder, but they do move more air. Some people have complained that the PlasmaWave is loud. Winix do address this by saying that sometimes, when particles move through the PlasmaWave, they make a “chirping” noise. Winix provides a 1-year warranty. Can I find it at other retailers like Bed Bath & Beyond? Bed Bath & Beyond does not stock the Winix 5300 for sale online. Home Depot currently sells the Winix PlasmaWave 5300. What’s The Best Price For The Winix Plasmawave 5300 and where can I buy it? The best price you will find is usually with Amazon, but the next best is with Home Depot. Check often as price changes all the time. Verdict: Is This air purifier For You? This is a good air purifier…with some hurdles to consider. If you are going to take bad reviews into account, as well as good ones, you might be put off by the slight chance of receiving a “dud” machine which might cease to work. You might also be worried by the mention of ozone and irritating noises. If you have no interest in PlasmaWave and auto-mode and you’d really rather a model with nothing resembling an ionizer, I would suggest you try another model. A good alternative could be the Honeywell HPA300. This air purifier is great for large rooms and it has true-HEPA filtration, 4 fan speeds, and a timer. It has a similar cleaning process in terms of filtration, but without any PlasmaWave-esque features. Read Next: Winix Plasmawave 6300 Review: A Complete (and Fancy) Solution?